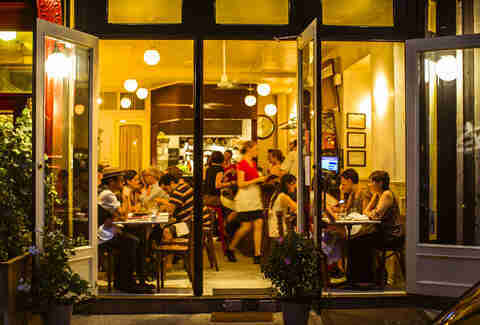 The East Village is consistently one of New York’s best neighborhoods for dining out. It’s completely packed with restaurants, including some old hangers-on from the area’s Eastern European and punk-rock pasts, and many more catering to today’s younger crowd. 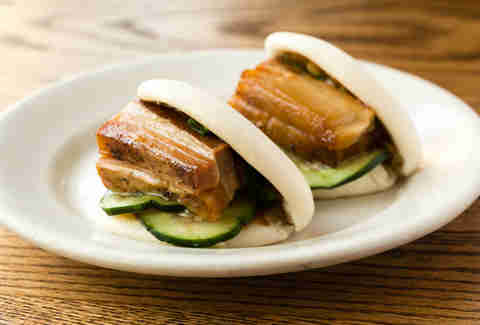 You’ll find just about everything here: It’s where the ramen craze started and where David Chang built his Momofuku empire, but it’s also where you can get anything from the city’s best bacon-wrapped hot dog to the best veggie burger. Since we know it can be overwhelming to navigate them all, here are our favorite 20. 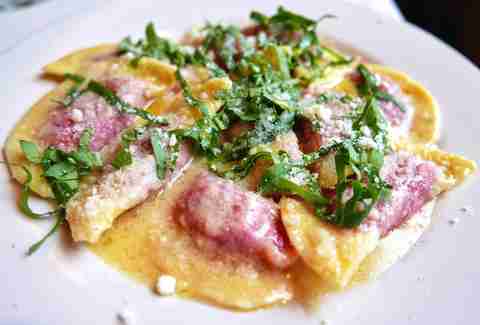 Chef Marco Canora’s seasonal Italian restaurant has become a neighborhood institution in the 14 years since it opened. It’s the kind of warm, reliable place that’s equally great for first dates or dinner with your parents, and Canora recently updated the menu to include more healthful whole grains and vegetables alongside high-quality meats, so that the food feels as fresh as ever. 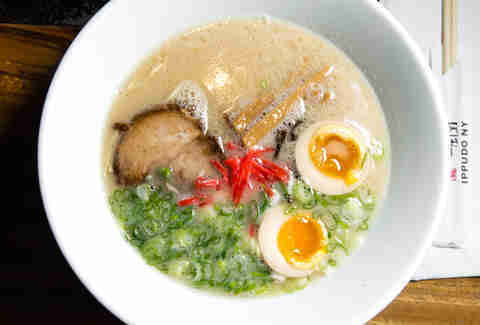 Thirteen years ago, David Chang opened Momofuku Noodle Bar: a tiny, hip ramen spot that took a little while to take off. But when it took off, it really took off. Not only do people still line up for its ramen and iconic pork buns, it’s also transformed into an enormous and diverse empire. Chang has restaurants all over the world now, but the East Village still contains all the best the Momofuku has to offer, from fried chicken sandwiches at Fuku to cereal milk at Milk Bar to bo ssam at Ssam Bar -- not to mention the original, still-excellent noodles at Noodle Bar. Huertas is a warm, laid-back spot where the homemade vermouth flows freely, and the Basque-style food is always delicious. You can keep it light with Spanish conservas (canned seafood) and two-bite pintxos like chorizo pate, throw in some larger shared dishes like skirt steak with piquillo peppers, or go all-in on a family-style eight to 10 course meal of the chef’s choosing. Just try not to miss happy hour from 5:30-7pm, when wines are $5, beers are $4, and a few other drink specials are $3 at the bar. The Sebastian’s Steakhouse Burger at the Brindle Room is often declared one of the best burgers in New York, and for good reason. Made from a blend of ground beef, fatty deckle, and dry-aged steak trimmings, the patty is rich and funky, best when seared to a juicy medium rare. 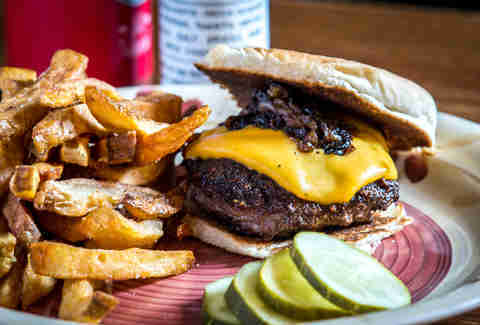 It comes topped simply with caramelized onions and American cheese, and at $17, it’s pretty reasonably priced for a dry-aged burger in New York. Bacon-wrapped, deep-fried hot dogs. That is pretty much all you need to know about Crif Dogs, the basement-level spot on St. Marks that has been feeding the tipsy masses some of New York’s finest dogs since 2001. Ideally, get one in the form of the Spicy Redneck, topped with chili, cole slaw, and jalapeños, or the Good Morning, which adds a fried egg and American cheese to make a kind of hot dog-ified breakfast sandwich. 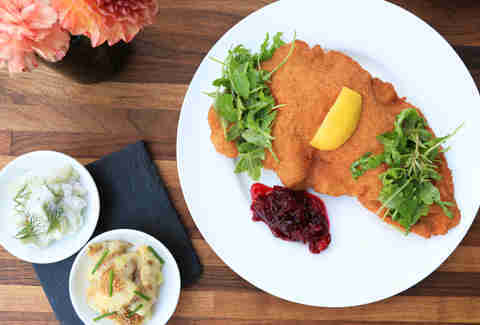 This rustic Austrian restaurant, which looks like the inside of some old European barn, does a perfect, classic pork schnitzel. It’s thin and crisp and golden, practically the size of the plate, and comes with two small dishes of German potato salad and creamy cucumber salad. The most casual of Chef Alex Stupak’s small modern Mexican empire is really more of a bar than a restaurant, with a taco counter stuck at the back. 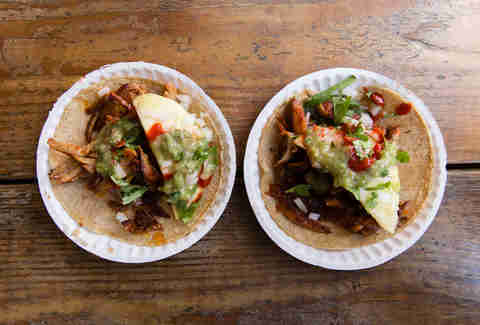 But that doesn’t mean the tacos aren’t stellar, from the house-made tortillas to fillings that range from the traditional crispy, fatty al pastor to the less traditional cheeseburger. Just make sure to hit up the self-serve salsa station. So much about this beloved neighborhood staple is sweet and grandmotherly, from the picket fence out front to the tables wrapped in floral prints. The same goes for the pasta, assuming your grandmother is an Italian nonna who makes her plump, tender tortellini by hand and cooks a mean ragu. 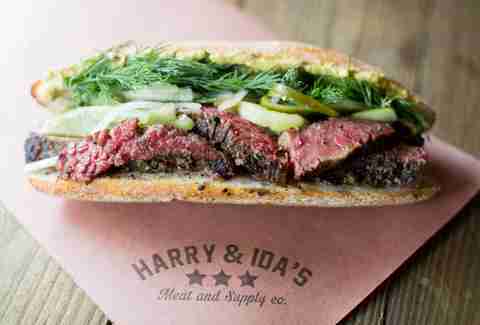 This sandwich shop/grocery store offshoot of Ducks Eatery (another EV staple) specializes in smoked meats, wacky fermented condiments, and all-around delicious sandwiches. The pastrami sandwich, made with buttermilk fermented cucumbers, anchovy mustard, and thick slices of tender pastrami, is the most popular, but if you like smoked fish, don’t be afraid to try the house-smoked eel sandwich -- it’s something you won’t find anywhere else in the city. Motorino makes some of the best Neapolitan pies in the city, with a chewy, nicely charred crust and an ideal balance of melty toppings to puffy edges. 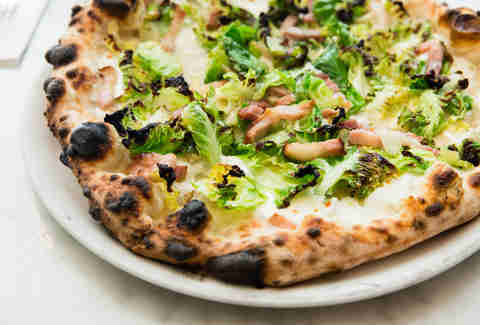 Not to mention the fact that the Brussels sprout pizza -- topped with mozzarella, smokey pancetta, crispy-edged Brussels sprout leaves, and a dusting of pecorino -- has converted many a Brussels hater. 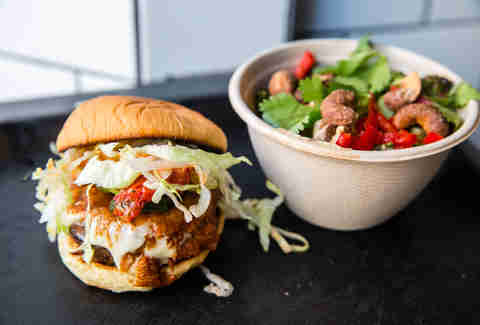 There’s no other vegetarian restaurant -- and maybe no other restaurant period -- like Superiority Burger. It’s tiny, irreverent, creative, and every dish packs in more flavor than you’d think $5 or $6 could buy. The veggie burger is one of the best in New York, but everything else is equally on-point and often “accidentally vegan.” Chef Brooks Headley was also the pastry chef at Del Posto for many years, so don’t miss his gelato of the day. 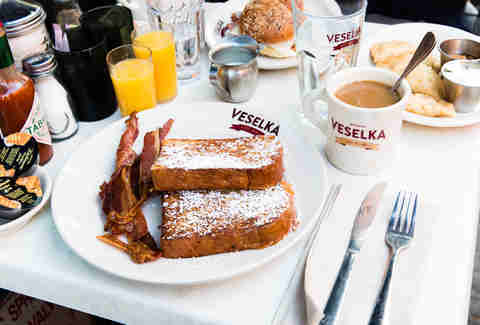 After a long night out in the sea of East Village bars, there’s really just one place to go: Veselka. For decades this 24-hour Ukrainian diner has been helping ragged partiers soak up the alcohol with pierogies, pancakes, and borscht -- and it makes an equally good stop for those plagued with a hangover the next day. Don’t come to Oiji expecting a raucous Korean BBQ spot. 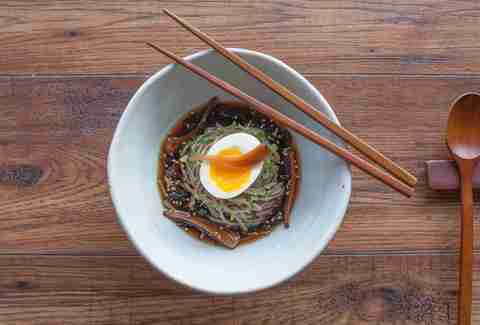 This hip, modern restaurant, helmed by a couple alums of Bouley and Gramercy Tavern, offers upscale-dining takes on Korean classics, like mackerel smoked with pine needles, truffle seafood broth with crispy rice, or slow-cooked baby octopus in a butter-gochujang sauce. It also is responsible for one of New York’s biggest viral food sensations of 2015: honey butter potato chips, a hot, fresh take on a cult Korean snack. 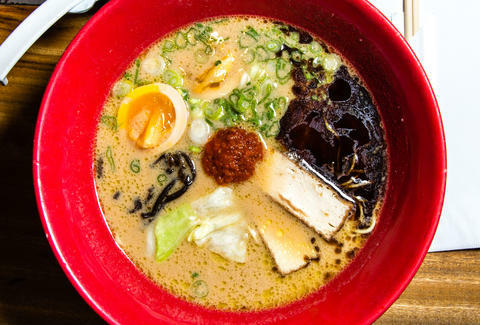 This Japanese import -- the chain’s first international location -- arguably helped spark the ramen frenzy in New York when it opened here in 2008. And it still draws long lines for those deep bowls of rich, silky tonkatsu broth and springy noodles topped with roast pork, soy eggs, and all the other accoutrements. 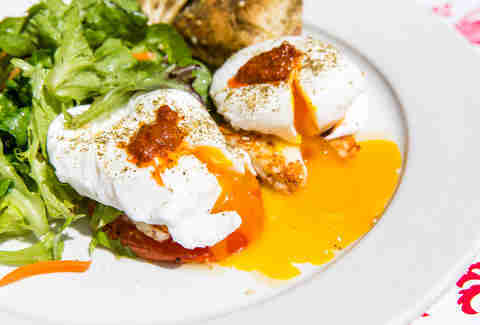 For a totally solid brunch that is neither overly ordinary nor overly precious, Cafe Mogador is the neighborhood go-to. 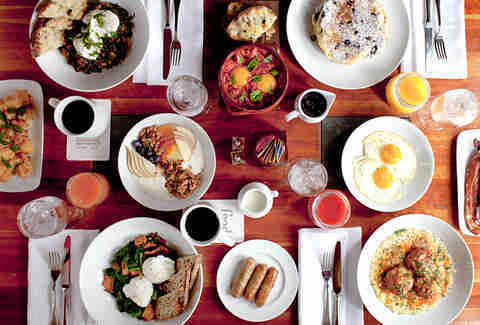 It’s been serving hearty and affordable Middle Eastern and Moroccan-style eggs, mezze, and more since 1983. It’s a lesser-known fact that the East Village is home to NYC’s own Little Tokyo. Japanese restaurants and businesses abound in the neighborhood, including this sleek, unmarked subterranean restaurant serving some of the most sophisticated Japanese cuisine in town. 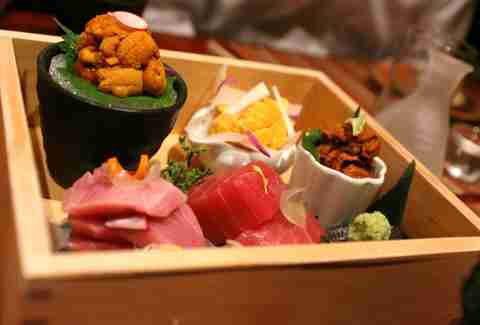 Reserve in advance to try the $120 kaiseki, a coursed meal of sushi and other small bites, but there’s also an à la carte menu featuring pressed sushi, silky chawanmushi (steamed savory custard), perfect tempura, and more. 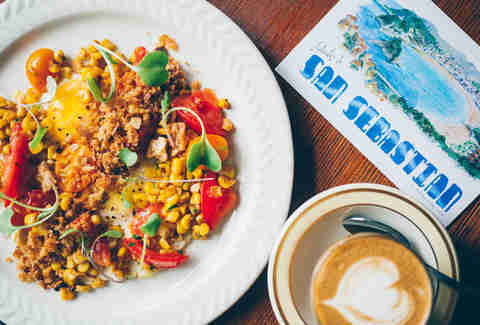 Filipino food has been particularly in vogue recently, but Chef Miguel Trinidad has been serving his take on Pinoy classics for five years now. Don’t miss dishes like the Bicol Express, a flavor-packed plate of slow-roasted pork shoulder with coconut milk, shrimp paste, chilies, vegan longganisa, and bok choy, or the famous Chori Burger, a patty made with a blend of beef and longganisa, topped with spicy banana ketchup, Maggi aioli, and house-made pickles. And if you’re brave, start your dinner off with balut, the hard-boiled fertilized duck egg that is a Filipino delicacy. Just try not to be totally charmed by Prune, Chef Gabrielle Hamilton’s cozy little New York classic. The food is rustic New American and often simple but astounding -- dishes include the likes of grilled pigeon with warm parsley vinaigrette, or cold green beans dressed with shallots and lemon zest. Just be advised that brunch is usually nuts; dinner is when the locals go. This is not your average pad Thai-takeout joint. Like some of the other exciting Thai restaurants to arrive in Manhattan and Brooklyn in the past five years, Somtum Der specializes in food from the Isan region of Thailand: tart papaya salads funky with fish sauce, and fiery, herbaceous larbs (minced meat salads). 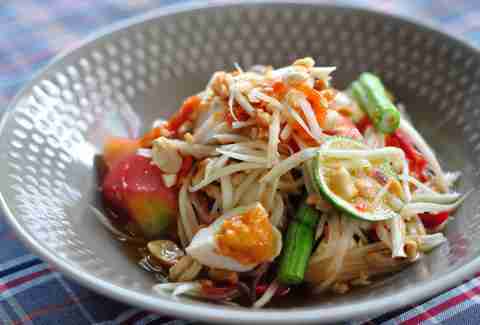 The restaurant originated in Bangkok, and as a result, the dishes here are particularly bright and ferociously spicy. This Philadelphia chain with a cult following consistently attracts big crowds and long waits, but it’s worth it for a plate of lip-numbing dry pepper chicken wings and bowl of slippery, spicy dan dan noodles. Even if fiery, tingly Sichuan flavors aren’t your thing, there are plenty of other great dishes on the menu, all given a spiciness rating of 1 to 10. Marguerite Preston is a freelance writer based in Brooklyn, which means restaurants are pretty much the only reason she goes to Manhattan.